A few months ago, I posted my crispy pork belly recipe, which was not paleo (due to soy sauce and miso paste being used), but it was also not AIP friendly because it also contains sesame oil (sesame is a seed and therefor not part of the AIP protocol), in addition, it also contained five spice powder, which according to Wikipedia, contains fennel seeds (Again not AIP). And the dipping sauce I served with it is also not AIP-friendly due to the chilli and soy sauce. I had 2 pieces of pork belly in my freezer however, and was wondering how I could make this recipe (which is delicious!) in to a form that I could eat on the paleo AIP protocol that I am following. First of all, I knew I wanted to keep the crispiness of the skin that I achieved in the original recipe – that was fairly simple, it is achieved by scoring the skin and then pouring boiling water over it to scald it, and then allowing it to dry out over several hours in the refrigerator. Achieving the Asian flavours without the use of the miso and soy sauce was more difficult. I did manage to achieve it though with the aid of coconut aminos, fish sauce, ginger, garlic and a homemade five-spice blend (recipe below) that did not include any non-elimination stage spices. 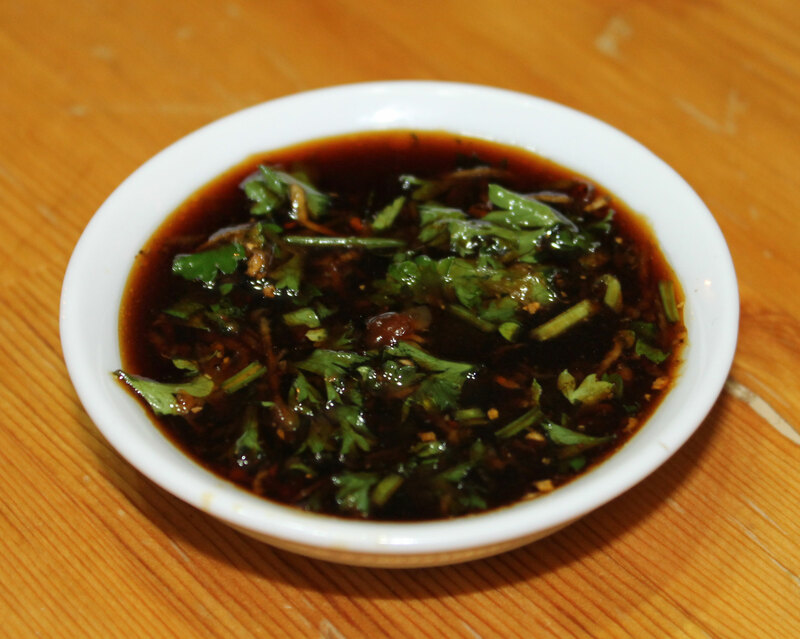 I also modified the dipping sauce to not include any chilli or sesame oil. I took my portion of the sauce and then added sriracha sauce for my chilli loving family members who are not following the AIP-protocol. This recipe is paleo, and to the best of my knowledge it is AIP-friendly. As in my previous recipe, give this plenty of time – start it 24 hours before you plan to eat it for the most crispy skin. The longer it sits in the refrigerator the better result you will get. The initial instructions are not much different from the original recipe…. you take your pork belly and score the skin, taking care not to go so deep that you penetrate the fat and go down into the meat (a very sharp knife is needed for this, although I have seen recommendations to use a scalpel blade for it… never tried it, may try that next time! It makes sense though, because pig skin is very similar to human skin – heck they test sunscreen on pigs!). Aim for a cut every 1cm/½” but you don’t have to be too precise about it. After scoring the skin, you need to place your pork belly on a wire rack and pour a kettle-full of boiling water all over it – this step is vital, it is what makes that wonderful crispiness that we are trying to achieve. Place the wire rack over the sink before pouring the boiling water over – it is easier that way. Once scalded with the boiling water you are going to stash your pork in the refrigerator still sat on the wire rack for as long as possible. Aim for at least 2 hours, but 24 hours is not too much. You are drying out the skin here, and that is what is going to give you that perfectly crisp crackling when you cook it. For the last 2 hours or even more, you are going to marinade your pork. In my previous recipe I had you rub your pork belly with a mixture of miso and soy sauce. This time you are going to use a mix of the ginger, garlic, five-spice, honey, coconut aminos and fish sauce. Mix all these ingredients in a shallow dish and sit the flesh side only of you pork belly in the marinade. Put the dish back in the refrigerator and leave it until you are ready to cook it. The longer it marinates, the better flavour you will get in your meat. 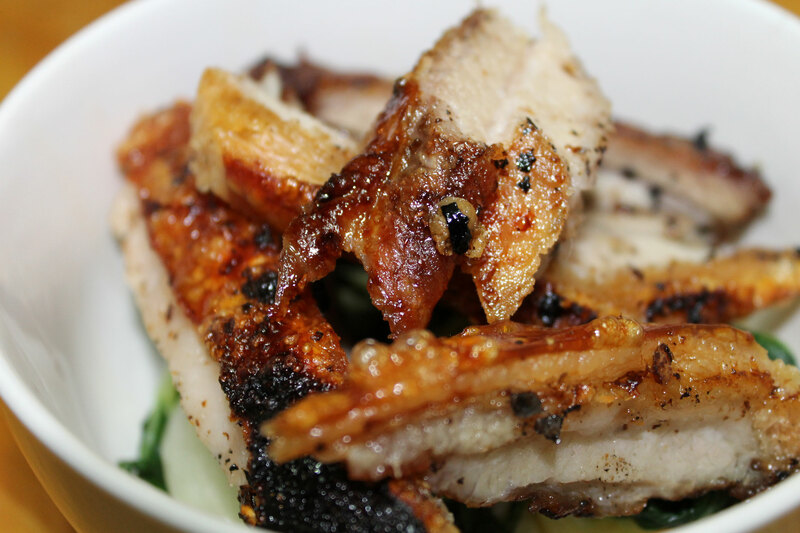 Once the time comes to cook your pork belly, preheat the oven to 180°C/350°F. Place the pork on a wire rack in a roasting tray (skin side up), scatter it with the sea salt, and roast for 1½ – 2 hours until the meat is cooked through. Increase the oven temperature to 220°C/425F and continue cooking until the skin is crispy. Remove the pork from the oven and allow to rest for 15-30 minutes while you prepare what ever you are serving with your pork belly (this time I serve stirfried bok choi and a dipping sauce). 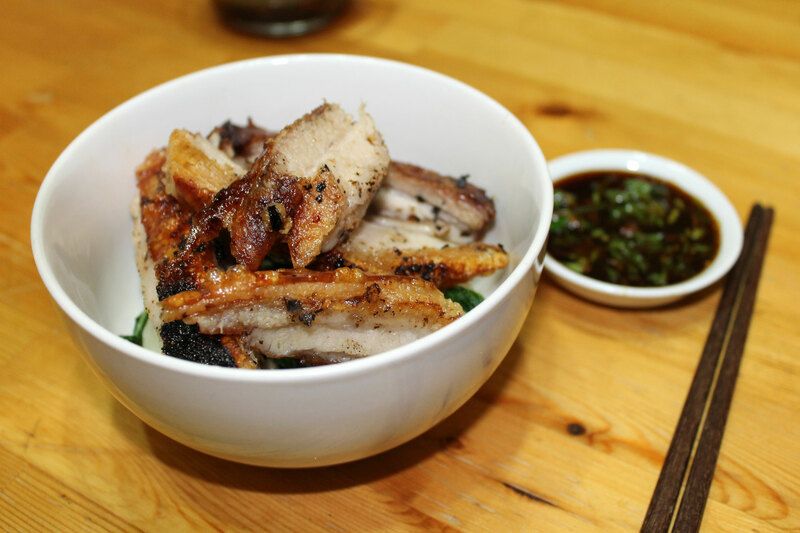 Mix all the ingredients together and serve with the crispy pork belly. For those who are not AIP, you can add sriracha sauce or diced red chilli to taste to the dipping sauce. If you have a family that is a mixture of AIP and non-AIP, as ours is, simply take out the dipping sauce portions for the AIP people and add the chilli to the rest. 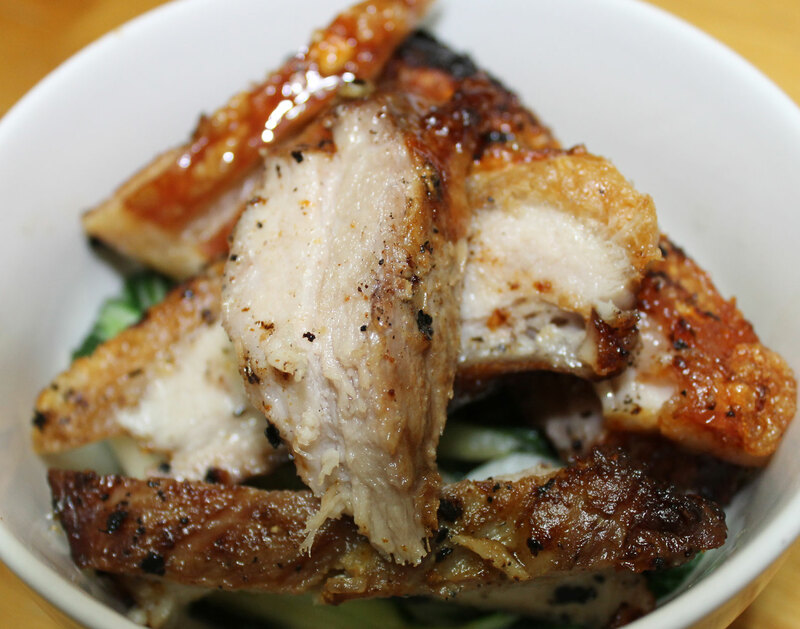 I served the pork belly on top of a bed of stir-fried bok choi with the dipping sauce. There were no leftovers! mix all the spices together and use as directed in the recipe. This entry was posted in Autoimmune Protocol Foods, Recipes and tagged AIP, allergy-free, asian, autoimmune, chinese, crackling, five-spice, gain-free, gluten-free, low carb, paleo, pork belly, primal, sugar-free. Bookmark the permalink. Nice dish. I marinated the meat over night. Great flavor. Next time, I’ll dust with less salt. Would recommend lining the roasting pan (bottom and sides) with tin foil to save on clean up time.